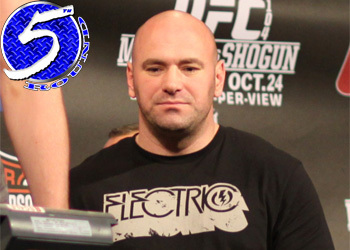 UFC president Dana White has just released his latest video blog featuring a boxing legend. Although James Toney is set to make his mixed martial arts debut this Saturday at “UFC 118: Edgar vs. Penn 2,” it’s actually former undisputed heavyweight champ Mike Tyson that makes a cameo in the promoter’s vlog. Watch as the two icons go into great detail regarding Toney’s chances this weekend in Boston, his Chael Sonnen-esque smack talking skills, as well as a potential future bout with 265-pound champion Brock Lesnar. “It’s gonna be very interesting. I’m excited to see this fight. Toney is a crazy guy. He’s a really kinda dark, crazy guy,” Tyson said. Wow, James Toney must be nuts if “Iron” Mike thinks he’s coo-coo for Coco Puffs. If you think that comment was off the wall, White follows that up by claiming Toney would be in title contention if he takes down UFC Hall of Famer Randy Couture inside the TD Garden this weekend. Couture is a significant 7-to-1 favorite to rudely welcome Toney into the violent world of MMA.